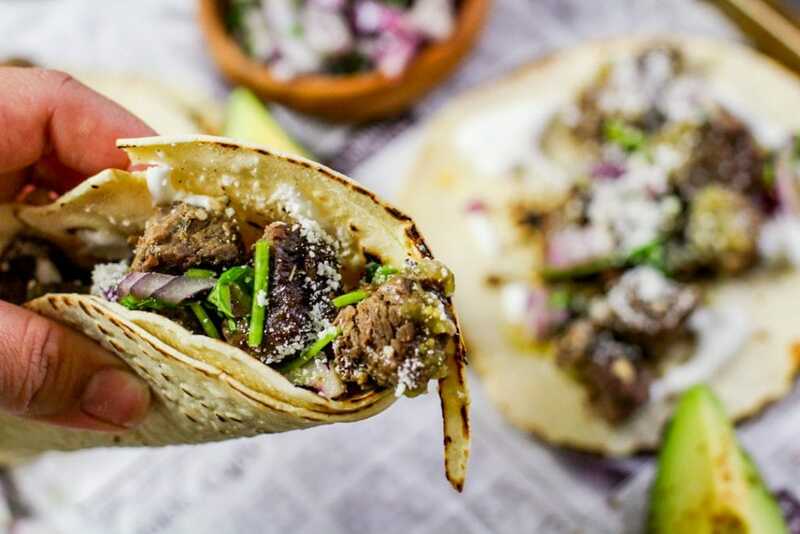 Tender and flavorful, an Instant Pot steak recipe is transformed into the best barbacoa beef taco! Made in the Cuban barbacoa style, this steak, butter, and soy sauce mixture is a simple masterpiece in the culinary world. What kind of steak is good for tacos? For this barbacoa taco recipe, I am using rib eye that was chopped into 1 inch pieces. Rib eye cooks amazingly well in the Instant Pot and comes out extremely tender, yet holds it shape to the pressure of the Instant Pot. 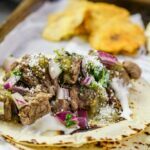 If you’re cooking your barbacoa beef on the stove, you can choose to use skirt steak or flank steak for your steak taco recipe. 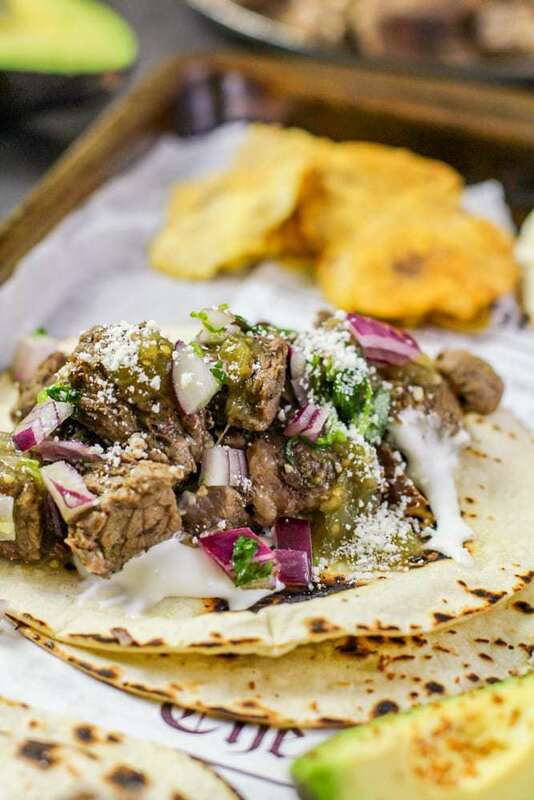 What kind of steak is used for street tacos? I love me a good street taco, I really do! In Allentown, Pennsylvania there’s a little hole in the wall bodega (corner store) that has an underground restaurant in it that have the BEST STREET TACOS. I mean, that’s as close to street catering Allentown has for now. 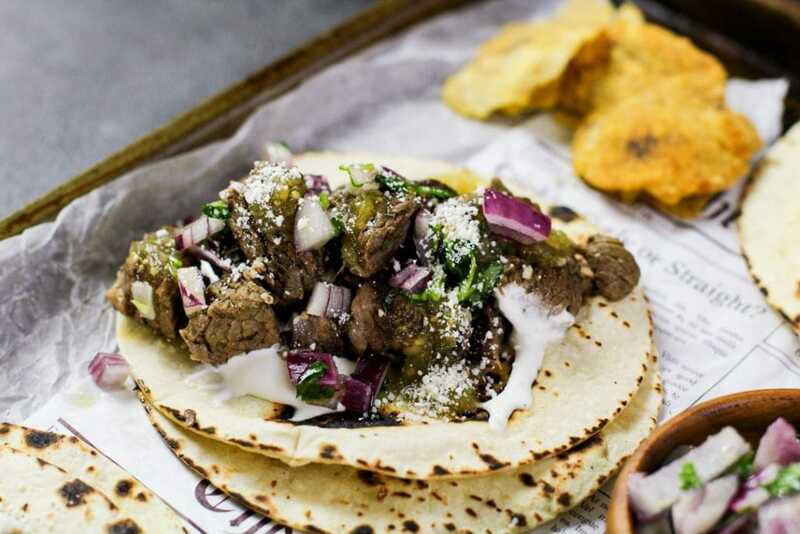 The most common kind of steak used for street tacos is carne asada which is a thin cut of steak. Usually skirt steak that’s then shredded. In my opinion, a good street taco isn’t necessarily the cut of the meat, but the size of the tortilla and the topping. You can use flank steak, skirt steak, or even rib eye for steak tacos. 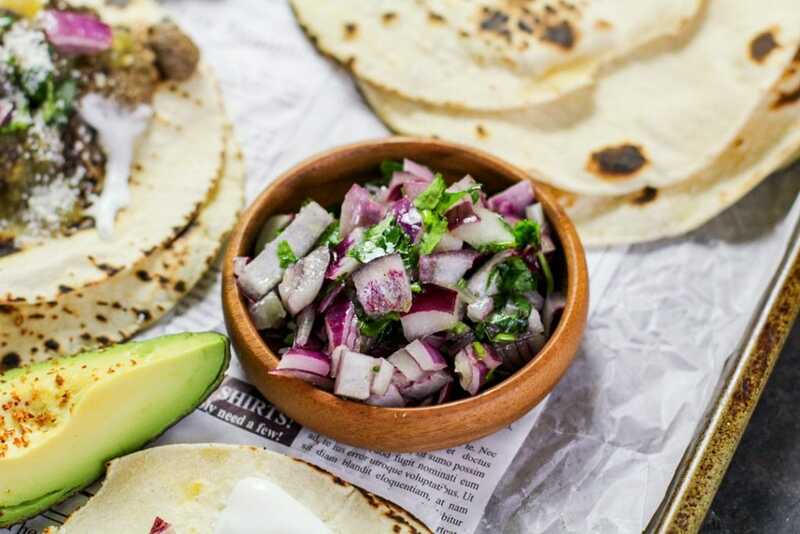 A good street taco always comes in small servings (3-4 small tacos) with a fresh topping of chopped onions and cilantro that’s been tossed with olive oil, lime juice, and salt. Seriously simple and so good! Anything more is a bonus. How do you make steak tacos? 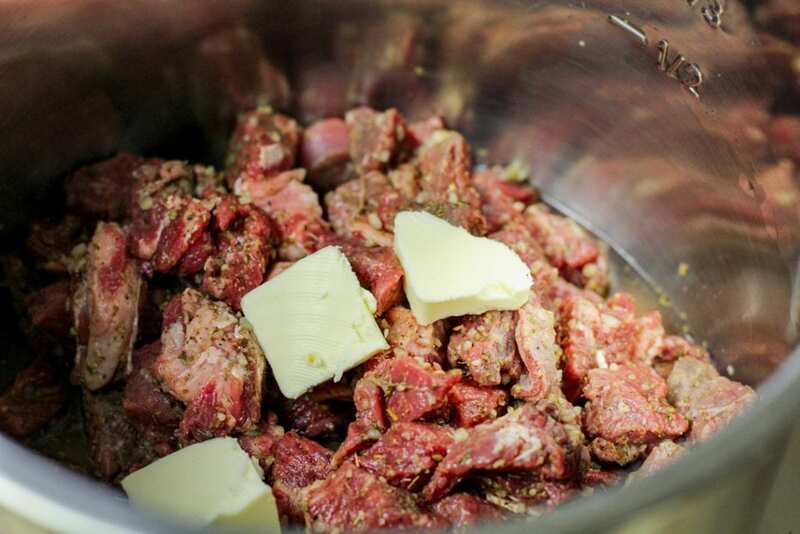 First, we need to chop our beef and marinate it to make it a baraboca beef recipe. We will not be seasoning our beef with a taco bell seasoning packet. For this barbacoa beef recipe we will season our steak that has been cut into 1 inch chunks with salt, pepper, cumin, dried oregano, minced garlic, and apple cider vinegar. Combine it well and you can either let it rest on the counter for half an hour before cooking or refrigerate a few hours or overnight for maximum flavor. If you decide to refrigerate it, be sure to cover the bowl. As far as the fat is concerned, if there is an absurd excess amount, by all means, remove it. But having a few pieces with a little fat on it is great. With this method of cooking the fat on the barbacoa beef is tender and honestly smooth as butter! A little guilty pleasure. How do you cook steak for tacos in an Instant Pot? Cooking steak in the Instant Pot is just like cooking on the stove. For a small batch of steak that is thin, you can cook it entirely on saute mode. For a thicker cut of meat or for a guisado (stew) like, you’re going to want to marinate it and add a little bit of water and pressure cook it. Google your cut of meat and the size of it for the exact timing of how long you should cook your steak tacos in the Instant Pot. For this barbacoa taco recipe, once your meat is marinated, we’re going to add it to the Instant Pot and add half a cup of water. 2 tablespoons of butter, and 3 tablespoons of soy sauce. Close the lid, set to sealing, and high pressure for 20 minutes. Hit cancel once the timer is done, allow it to naturally release for 10 minutes before setting it to quick release. Once the barbacoa beef is cooked, you’re going to want to serve them right away. There will be excess juice in the pot. You can strain your meat before layering it onto the tortillas. For these barbacoa tacos, I drizzled Mexican crema (table sour cream) onto the tortillas, generously topped it with steak, and then I added a salsa verde sauce, and a chopped onion and cilantro lime relish. Whew. Then I dusted the tacos with cotija cheese. And because I’m a fatty, I added avocado chunks to mine. All Mexican street tacos have this onion, cilantro, lime juice relish. It’s fresh, slightly spicy, and hit with the right amount of citrus. Basically, it’s the perfect taco topping. Take the lime and the coconut rest of the ingredients and mix it all up. Man, now I want to watch Practical Magic! Please tell me I’m not alone, please?! Yay! Gracias. That’s all it takes to make this perfect taco relish for these yummy barbocoa tacos! If you make this recipe, please leave a comment/rating. I also would LOVE for you to tag me with a photo on Facebook or Instagram! I love to respond to all of the comments, and this blog is to serve you, mi familia! Let’s talk in the comment section below. 🙂 Buen provecho mi gente! 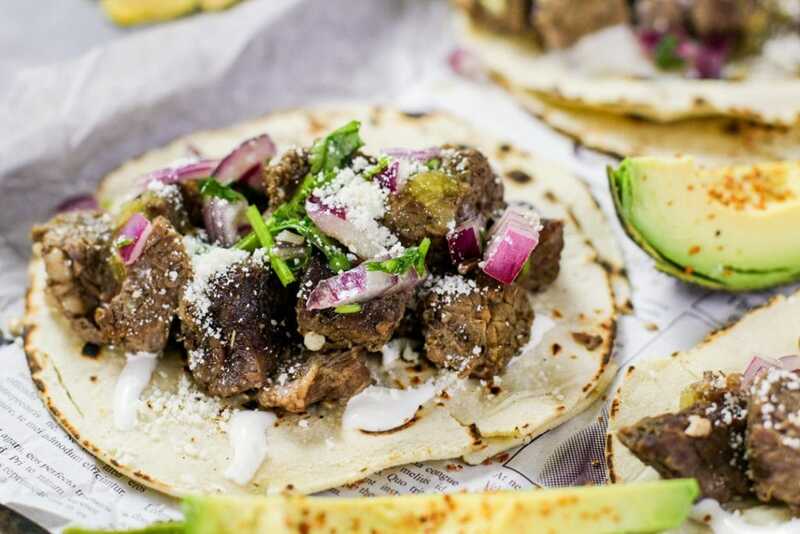 Tender and flavorful, this Instant Pot barbacoa beef taco recipe is perfect for Taco Tuesday! 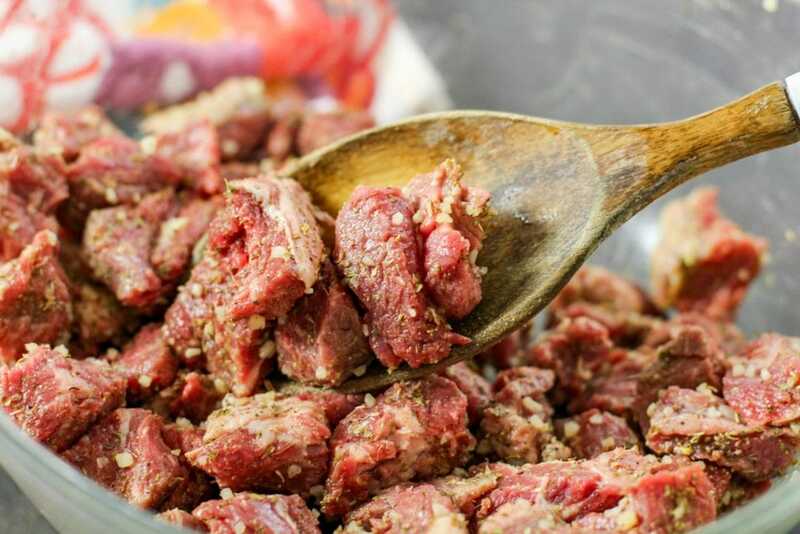 Marinate beef with salt, pepper, cumin, oregano, garlic, and vinegar for a minimum of half an hour. Add beef mixture, butter, soy sauce, and water to the Instant Pot, cover, set to seat. Set high pressure to 20 minutes. Once timer goes off, press cancel, and allow to naturally release for 5-10 minutes before moving the knob to quick release. Drain your barbacoa beef, and assemble your tacos as desired.